A mock up of what Mentone Elementary believes the solar panels will look like. MENTONE — Mentone Elementary is jumping into the go green pool with some big plans. 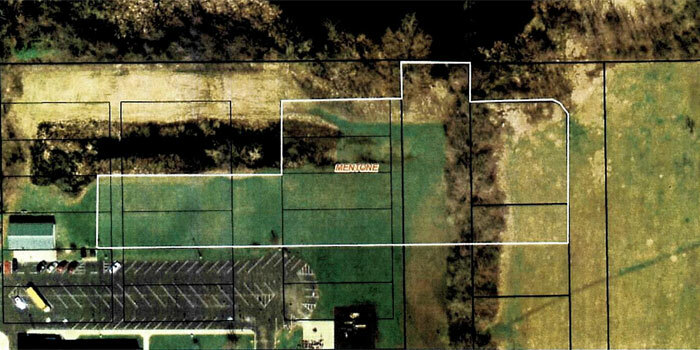 The Tippecanoe Valley School Board approved four resolutions for the Mentone Solar Project, pushing the project forward at its board meeting Monday night, Nov. 13, at Mentone. In the fall of 2014, TIppecanoe Valley School Corporation began exploring new ways of being able to “maintain [its] schools, maintain [its] programs and services by generating revenue in new and different ways.” One of those ways was through solar energies. However, the schools were looking at over a million dollars to install solar panels. “During that three year period while the purchase price of electricity has continued to increase, the efficiencies of solar equipment have improved while the equipment costs have gone down. We’re at a point where solar energy makes sense for Tippecanoe Valley,” explained Superintendent Brett Boggs. Valley will be able to sell all unused energy back to NIPSCO for the purchasing price of electricity. The panels are estimated to generate 528,000 KWH Solar Array in energy output which “will be enough to power” the entirety of Mentone Elementary. The panels will be purchased from and installed by Ag Technologies out of Rochester while the adjustable steel support system will be made by Craig Welding in Mentone. “Bringing solar power to Mentone is going to be a wise financial decision that will benefit the school corporation for years to come,” said Boggs. The panels are expected to be up and running by Jan. 1, 2018. Dawn Rowland and Audrey Summe received the Pillar Award for Outstanding Support Staff. June Yazel was selected for the World Class Teacher Award. The board approved the addition of the Online Fundraising Policy to the School Board Policy. The board approved the 2018-19 school calendar. 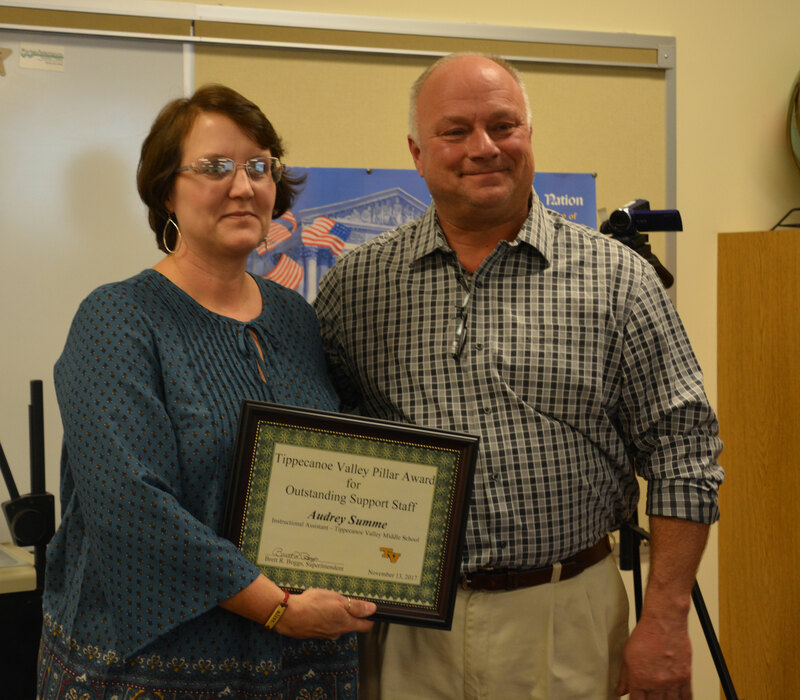 TVMS Instructional Assistant Audrey Summe received the Pillar Award for Outstanding Support Staff Monday night at the regular board meeting. 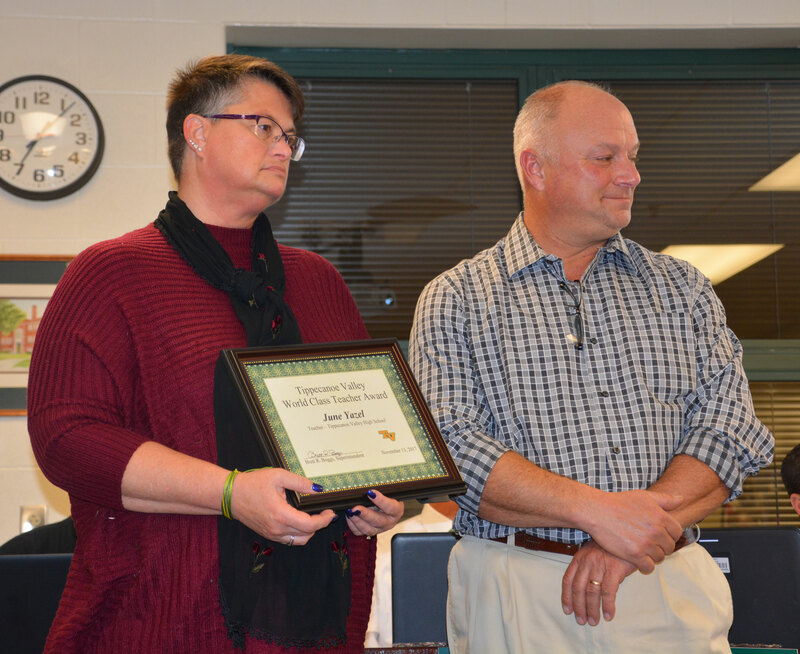 Pictured from the left, are Audrey Summe and school board member Todd Hoffman. 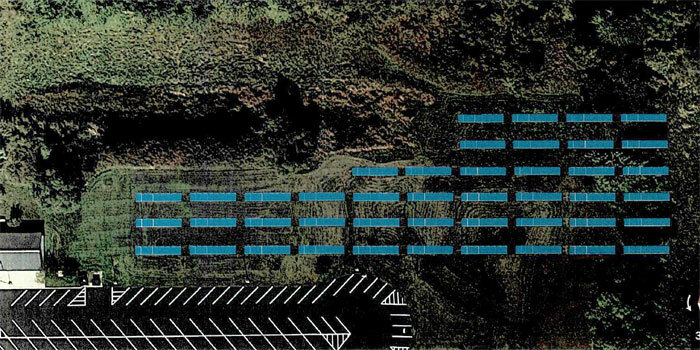 An outline of the 1.5 acres where the solar panels are expected to go with a 5 foot fence surrounding them.